We designed the new Tidal saltwater fly rods to make the challenges a little less, well... challenging. Accurate presentations to cruising fish and good turnover into the wind are now easier than ever. These salt specific rods load quickly, generate high line speed with a relaxed casting stroke, and have ample power to control hard fighting fish. 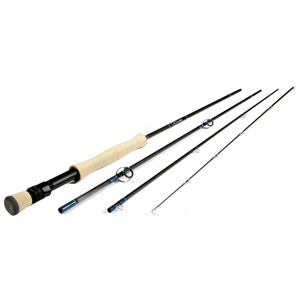 Take the new Tidal series fly rods on your next saltwater adventure. They’ll make the Hard Way a bit easier… and might even make your guide smile, too. Bonefish, schoolie stripers, and our own saltwater species in Europe, beware. The Tidal 7 weight is the perfect tool to deliver flies to these saltwater favorites. This rod generates very high line speed and tight loops to deliver smaller flies accurately at any distance and to quickly land speedy fish. The all around work horse of our Tidal saltwater series, this rod will handle most saltwater situations easily and effectively. It casts a wide variety of fly sizes, and is powerful enough to handle any bonefish, most permit, stripers, smaller jacks and inshore species. Tarpon, trevally, and offshore species as Halibut in north of Norway are easily handled with the Tidal #12. The rod of choice when raw power is the most important factor in your fishing success. Tarpon, trevally, and offshore species as Halibut in north of Norway are easily handled with the Tidal #10. The rod of choice when raw power is the most important factor in your fishing success. When fish size, fly size or weight start to climb, reach for the Tidal 9 line rod. There is a noticeable jump in power over the 8 line rod both for casting big flies and controlling hard running and fighting fish.